The president let his opponent punch himself out in this week's debate, Michael E. Ross writes in his Short Sharp Shock blog at Open Salon. Everyone thought Mitt Romney did a great job … but what did he do a great job doing? Testily going on offense from a defensive crouch; proposing to do what the Obama administration has already done; and furthering the distortions and Etch a Sketch rewrites that have defined his campaign from the beginning — and doing it in front of an audience of at least 50 million people. Not a bad night’s work. 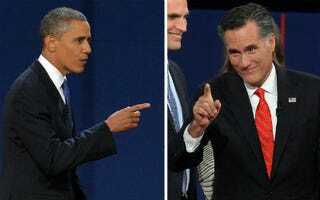 With his back not just against the wall but pushing through it, Romney did throw a lot of punches last night, and Obama gave as good as he got. But looking through the lens of the long game, President Obama actually won the first debate, on points. It was a stealth TKO: the president revealed the weaknesses of his opponent with minimal exertion. And he did it in the most elegant, ruthlessly efficient way you can imagine: by letting his opponent do it to himself. Read Michael E. Ross' entire piece at Short Sharp Shock.